a fairy tale beginning with a delectable end! Boldly based in rooibos, the mellow notes of vanilla, rich texture of chocolate & the defining essence of mint all blend together deliciously ever after. 1 oz. SAMPLES MAKES 10 CUPS INGREDIENTS: Apple, Cacao Beans, Chocolate Bits, Chocolate Flavor (Natural), Cream Flavor (Natural), Peppermint (Organic), Rooibos (Organic), Vanilla Flavor (Natural), White Chocolate Bits Steeping Instructions: Fill kettle with fresh water, then heat. 2. Warm your teapot with a little hot water, discard, place your tea leaves in teapot, allowing heat of the pot to release bouquet of the tea leaves. 3. Heat water to rolling boil (212°). 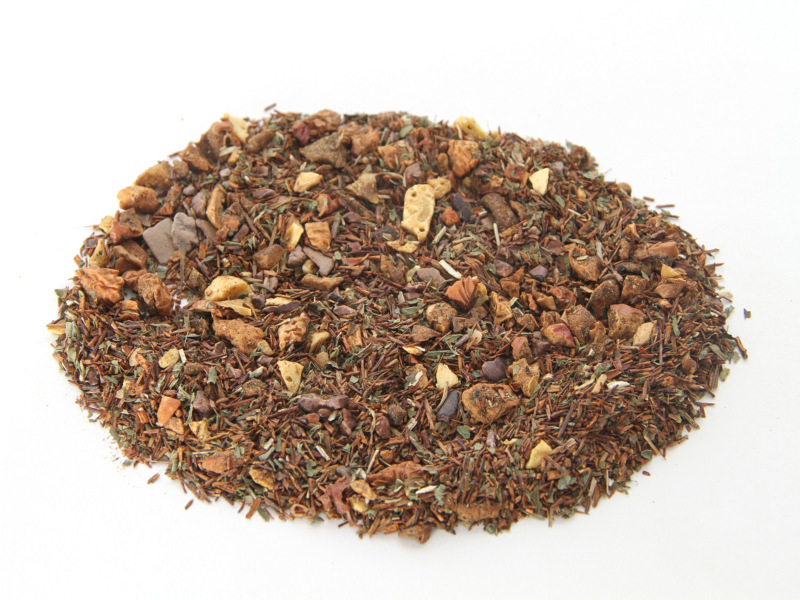 Steep 1 teaspoon (2.5 g/8 oz. cup) up to 5 minutes. NOTE: Vary time according to taste, & remember that steeping tea leave beyond 5 mins will give you a bitter taste ***This information is for educational purposes. This information has not been evaluated by the Food and Drug Administration and is not intended to diagnose, treat, cure or prevent any disease.